Barracks Lane Community Garden is a beautiful green space at the heart of a vibrant community. It is for everyone to use and enjoy by visiting, booking for a private function or by coming along to one of the many events and activities that are held throughout the year. The Garden Project has charitable status and is run by members of the local community who volunteer their time and expertise. At the Garden you will find a large octagonal eco cabin with a wood burning stove, a bonfire and barbeque area, a basic kitchen, table and chairs, a wood fired bread oven, cob oven and tandoor oven, sandpit and small, fenced pond. The Garden is fully accessible if you are using a wheelchair or have limited mobility and safe if you have small children. There is a fully accessible composting toilet. We are particularly proud of the Garden Project’s low carbon and green credentials. Within the Garden is a living green roof and solar panels, a rainwater harvesting system, a compost system, a wildlife corridor and bug hotel. These were designed, built and sponsored by members of the community. You can find out more about these features in our Resources section. Cares for the environment, the soil, plants, water and wildlife. Offers everyone access to a green space for relaxation and leisure. 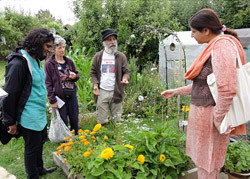 Demonstrates practical ideas for healthy living including growing food, recycling waste, cooking, building and using renewable technologies. Encourages play and learning through opportunity, demonstrations and workshops. Is safe and welcoming, celebrating diversity and promoting equality. Is creative and innovative, a place where art meets science across generations and cultures. We hope you feel inspired to come and visit the Garden and we look forward to seeing you there. Who we are - find out about the garden's trustees and staff. Find out about our partners & funders. Find out about projects and outreach.